There is a distinct irregularity to my attendance at football matches. There is no routine to speak of, no club football season ticket offering the same surroundings every second week, the same weekly or fortnightly pre match ritual or the same religious focus on a single team throughout each season. This is due to a variety of factors including finances, work, location and family as well as a previous fledgling amateur football career taking up my Saturday afternoons. The attendance at football matches has therefore become more of an experience. This has for some years been a chance to catch up with old friends, split through choices of University or work location requirements. Coming together for Scotland games , days out or trips away mean these occasions carry added significance and allow for an appreciation of the experience as a whole. A football match experience, either to Hampden or any number of grounds around the country will generally involve travelling to the chosen town or city, usually by train, where an arranged meeting point, be it the station or a nearby bar or café will allow everyone to exchange pleasantries, ask how everyone’s respective work is going without any real knowledge of what it is they do and answer “aye, good, busy” when it comes to your turn to respond. A bit of food, cup of tea or few pints will generally follow along with discussions of the bigger football news of the week, transfers or transfer rumours, midweek games, scandal and then a look ahead to the afternoon or evening’s entertainment. Pre match discussion for Scotland games at Hampden will generally centre around the deficiencies of the current squad or who we feel should have been called up and wasn’t, or simply a discussion outlining the various fears and concerns ahead of the match. In writing this, I realise the pre match discussion does sound to be very negative and pessimistic. This is not however an indication of our outlook. For the most part, we are relatively dedicated Scotland fans, signed up to the Supporters Club for a number of years and happy to reminisce about the good times, the night in Paris (with THAT McFadden goal which we were there to witness, following the “March” from Eiffel Tower to the Park de Princes) or similar positive results at home or abroad that we have been to. The pessimism I think comes from the fact that, being born in 1987, we were only 10 or 11 the last time Scotland qualified for a major tournament and enjoyed any sort of tangible success. At this point and with Euro 96 also under our belts, positivity and an expectation of qualification were common feelings towards Scotland. Since that point however, worryingly coinciding with our more dedicated match day following or increased interest in matches, following Scotland has been something of a struggle and labour of love. There have been waves of relative success over this period, the Smith and McLeish eras providing some notable high points, bookended by less favourable memories such as the Faroes under Vogts or the famous 4-6-0 in Prague under Levein (yes, I was there and yes, I was also raging). But all in, there has been a lack of any qualification and a general regression from just missing out (playoffs in ’99 and ’03) to completely missing out and finishing well off the pace as time has progressed. So I think the pessimism is borne out of frustration and disappointment that these rose tinted memories are not being matched. I would hasten to add however that we are not negative fans, simply turning up to moan and complain, it just seems that conversation is drawn to more negative aspects of Scotland performances given that tendency to look back to the good times with rose tinted spectacles. One justifiable complaint we all have with Scotland games are the ticket prices and the constant increase of such. Again, looking back with rose tinted glasses to round about the years 2001/02/03 tickets could be purchased through supermarkets or other official channels and wouldn’t be a lot more than £10-15 each depending on where you chose to sit and how many you bought. Adult plus child packages, priced at roughly £5 per adult with £2 per child were also available and represented excellent value – this certainly sparked our interest, splitting the cost between 4 or 5 boys, the younger looking ones taking child tickets and ones with the beginning of stubble taking the adult ticket. Since that point, prices have rocketed with tickets for a “big” game going for an RRP of around £60 for the 2016/17 campaign. Add on travel, food, drink on top of that you could easily be looking at in excess of £100 for your day out – that’s even before you know how well Scotland will perform. This is a large sum of money in anyone’s book and adds to growing arguments that fans are being priced out of football. After the social side of the game at pubs or bars in and around Glasgow City Centre or a quick taxi ride up towards Shawlands or Victoria Road, where further discussion is had on the potential line up with rumours flying about regarding this, updates coming through phones or the TV in the bar, exclamations of disappointment or surprise at certain starters or substitutes, we make our way to the bowl of Hampden. After the slow moving queue to enter the ground through the turnstiles, a cup of tea, pie (or two) and obligatory renditions of the Proclaimers, Runrig and the Flower of Scotland follow before the game kicks off. In truth, it has been a number of years since Scotland have gone toe to toe with any of the bigger footballing nations, such as France, Spain or Germany. Positive performances against these bigger (and better) teams tend to come from a resolute and organised defence whilst conceding ball possession and territory to the opponents. Notable results such as a 1-0 victory against France were achieved with such an approach, although looking back you do note that France missed chances, had goals disallowed and hit the post – so there was a degree of fortune with the result, although you could say well earned fortune through organisation and hard work. Tactically, technically and physically these nations seem to have accelerated away from Scotland. This could be down to a number of factors such as better organised youth systems, better quality of domestic leagues or simply better coaching. The SFA (and our friends to the south) have had a number of programmes, initiatives and reviews of the system, the operation and the game as a whole in order to try and pinpoint flaws, weaknesses and avenues to improvement. Answers to these problems remain elusive. Similarly, the fact remains that it does, sadly, appear that Scotland has fallen behind countries which 30-40 years ago we could stand up to and match. Watching these bigger games can therefore be a nervous affair, Scotland being dominated, the opposition seemingly always in space to receive and pick passes while Scotland players appear rushed and under pressure whenever in possession for short spells. Tending to stick to the tried and tested 4-5-1 formation, with slightly more attacking midfielders for the games against lesser opposition has been the modern day staple of Scotland teams (it could be argued that this 4-5-1 has evolved into a 4-2-3-1 or similar, but the basis remains relatively constant). More expansive styles have been adopted intermittently, but things do tend to revert back to this more solid approach, which has worked well against some good opposition on a number of occasions in the past. One slight frustration is that the single striker system has been very much in vogue for a number of years and is routinely adopted regardless of the opposition. This can lead to issues if the very much traditional “British” style of “big man up top” is used, particularly if said big man is limited in terms of running speed or skill. In his time, Kenny Miller (not a stereotypical big man) fulfilled this role admirably, combining tenacity with work rate and speed (if not hundreds of goals) to deliver some standout performances such as in a 1-1 draw with Italy in 2005. However, quite often the striker is left isolated with the supporting midfielders seemingly too “structured” or disciplined to break from the tactical shape set out on the white board in the dressing room to support the striker and cause the opposition problems. Having played as this “supporting midfielder” before (albeit for Aberdeen University when we were horsed 12-1 by Deveronvale from the Highland League) I do acknowledge that this role requires high levels of fitness (which I do/did not have), but also the tactical flexibility of other members of the team to cover and re-shape when one player breaks. Too often, from the stand watching a Scotland game, everything seems to be very structured and a lot seems to be lost in terms of attacking prowess with the requirement for players to remain positionally disciplined so as not to leave areas of space to be exploited. Now, this is only a supporter’s opinion and I do appreciate that there are enumerable other reasons why tactical discipline is a necessity, especially against some of the bigger and better teams. This approach does seem to be relatively common regardless of the opposition however. Even against what we might consider to be secondary or tertiary football nations such as the Czech Republic, Poland or Lithuania. Games against these nations can also be difficult and nervous. Particularly at home there is an emphasis on Scotland to attack, which doesn’t always sit well depending on the personnel chosen and seems to be counter intuitive given many of our better results have come from defensive solidity rather than attacking flair. There have been some good results however, but also some difficulties to be overcome. One very notable aspect to playing some of these secondary or tertiary teams, such as the the Czech side of the last 15 years has been the presence of players such as Tomas Rosicky in the line up. This is a style of player we in Scotland have not regularly seen in a national shirt, a proper old fashioned playmaker making the whole team tick and playing a part in every move the team makes. Dropping deep to pick up the ball from the goalkeeper or defence, moving the ball to other midfielders, playing an incisive pass into the striker and always, always seemingly in space. Alexandr Hleb of Belarus was another example of this style of player, while Andrea Pirlo for Italy provided a high quality variation on this ability to completely control and orchestrate a game of football. Examples have also been seen where teams like Germany have a number of such players to contend with, Ozil, Kroos, Muller et al providing an illustration of how to find and manage space on a football pitch in a 3-2 victory at Hampden in 2015. From a Scottish perspective, players like Scott Brown or Darren Fletcher offer different qualities but neither could be described as a playmaker in the same sense. This seems to be an aspect throughout Scottish football, playmakers are often seen as a luxury with the requirement for hard work often taking precedence here. Similarly there is often an emphasis to make sure that the spine of the team remains strong – so any skilful or less robust players like a playmaker are often moved out wide so as not to compromise defensive solidity. The dedicated playmaker, while interesting and pleasing to watch is not part of the wider Scottish footballing DNA it seems. Scotland have tended to do reasonably well against these secondary or tertiary teams at Hampden however, regularly coming away with victories with a few disappointing draws and defeats also thrown in for good measure. Games against opposition who are happy to defend presents another problem. The home game against Lithuania in 2016 presented an issue whereby Lithuania squeezed the game up into the middle third of the pitch, knowing that Scotland lacked the explosive pace and tactical freedom to break through the narrow lines created between midfield and defence. Whenever necessary the Lithuania defensive line dropped alongside the midfield to make through balls or anything other than a structured attack very difficult. This emphasised the lack of real flair or creativity within the Scotland side, the good solid players struggling to open up a well drilled defensive unit. The above proved a tactical frustration for the team and management but also from a fan’s perspective, seeing Scotland have to work very hard and struggle in a game where there were high expectations. The above covers the negatives and limitations of watching Scotland. On a more positive note, there have been many good times and great performances that keep us coming back for more. Defeating teams like France at Hampden are notable high points, but equally positive are results such as the 3-1 demolition of Ukraine in 2008, which completed Scotland’s best winning run since 1949 (6 wins on the spin). When Scotland do come out, perform and win, the experience is overwhelmingly positive. The best era for results and performances in my experience was between 2005-2008 with Walter Smith and Alex McLeish in charge. The Scotland teams of this era were very solid with Weir and McManus at the back, Fletcher and Ferguson in midfield, but with skill and flair in the form of James McFadden added to this. Well drilled defensively and offensively, these teams represented the cream of the crop in terms of players, many of whom playing at the top level either in England or for either of the Old Firm before the implosion of the blue half of that rivalry. Another important aspect about these teams during this period was the lack of “square pegs in round holes” in terms of players in positions. Every player represented a top quality option in that position, something that was lacking before and has been after this point. The national team should always be about being the cream of the crop of Scottish football. Handing caps out for limited reason or for good performances in the second tier of English football when there are better or more consistent players performing elsewhere does grate somewhat. One potential issue with the lack of top quality players to choose from could be apportioned to the quality of Scottish League football. This represents the second part of my base case of being a Scottish football fan. Club football in Scotland can vary greatly in quality from the top of the top league, to the bottom of the same league and even further down to the lower divisions and into the semi-professional or Junior ranks. Attending club matches offers a different experience, whether going to Montrose to watch a League 2 (old third division) game, Stenhousemuir for League 1 (now relegated to League 2), St Mirren in the Championship or Aberdeen in the Premier League. The outings will take the lead from Scotland games as outlined above, with the exception of getting the added excitement of being able to take the train or drive to new and different towns throughout Scotland, sample different local pubs, have lunch in different local cafes and of course experience the atmosphere and surroundings of a variety of interesting stadia. Pre match discussion will, depending on the match and how much knowledge we collectively have of the teams playing, usually centre around our expectations for the game, pinpointing players or names we recognise within the squads and commenting on the wasted talent or how “he was a decent player when he burst onto the scene”. The beauty of a number of Scottish clubs is the fact that stadiums and pitches are more often than not within town centres, or at least within a walk-able distance from the centre or train stations. This makes football far more accessible for fans, meaning that there are plenty options for meeting friends pre match, enjoying some food and coffees, teas or beers before heading to the ground. Hampden as above does offer an alternative with a bit more travelling involved and is probably at the limit of my own skewed judgement of acceptability, albeit with other, less central, options for pre match entertainment, but stadiums out of the centre reliant on driving, parking or intermittent public transport links do not represent an optimal solution. Alternatives or good examples are available elsewhere in Mainland Europe, but on general terms within Scotland stadiums outwith centres or not within walking distance of centres do lose a lot of their appeal for the average fan. There is of course acknowledgement that a shiny new stadium on the edge of the centre with road or transport links, room to expand and space for other facilities represent great options for clubs in terms of revenue, maintenance costs and the ability to have infrastructure available to accommodate 5-20,000 fans at weekly events without too much disruption of congestion within towns or cities. Diehard fans will see the benefits, better financial status for the club, more potential investment in the team and hopefully greater success. But for the average fan, who wants to travel to a game, maybe have a couple of beers before or after then be able to make their way home quickly and efficiently afterwards instead of sitting in traffic, this is not the best option. After making our way to the stadium, hopefully within walking distance from transport links and amenities, we enter the ground. Depending on the level of football you are seeing, you can expect to pay roughly £20-25 for a top level game or anything down to roughly £10 for a game at a lower level. These prices are a pretty uniform and represent the going rate for games within Scottish Football. There is something about lower league Scottish grounds which adds a greater sense of romance to the spectacle. An old stadium, crumbling walls, terracing, weeds and moss coming through cracks in the concrete, usually with one enclosure or a single seated stand are common throughout the lower leagues. This as well as the reasonably priced food and drink from kiosks, including the seemingly prerequisite homemade soup at most lower league grounds adds to a sense of comfort within the surroundings. There is a sense here that this is “proper” football, with communities pitching in to help the running of the club, somebody’s mother or auntie running the food kiosk, the old boy who last missed a match in the 1970’s selling half time draw tickets and local boys and girls earning their admission fee by working as ball boys and ball girls. Whether you reside, or have ever been to the town at all, there does always seem to be a sense of community at the lower league grounds which, understandably decreases as clubs and crowds increase in number as you move up the football league ladder. Attending games at higher levels also seems to increase the costs of pies, teas and coffees while these take on a more mass produced taste and quality at the same time – all of which is understandable and simple economics, but nonetheless does still impact upon the romanticism of the match. Tactical innovation is something that does largely appear to be reserved for the higher levels of Scottish Football. Without wanting to make any sweeping statements, experience would dictate that most teams favour a 4-4-2 set up or a 3-5-2 formation, generally with a “little and large” forward combination. There are instances of the national team staple 4-5-1 which could become a 4-3-3 at certain clubs but on the most part the old British favourite of a 4-4-2 seems to be most common in my experience. Without going into too much detail of the 4-4-2 or other formations in terms of history and evolution, I would say from my own experience that these formations represent almost a default for a team. Everyone growing up played in a 4-4-2 formation, with variations to other systems tried out from time to time. But these formations represent a good, solid foundation for a team. A couple of big centre halves, a pit-bull of a central midfielder alongside another with a bit more skill and vision, at least one fast winger with limited crossing ability, a full back with better crossing ability and as above, the little and large, quick and “big man” forward arrangement. This is a pattern roughly seen in games such as Montrose v Cowdenbeath in 2016 or Alloa v Queen of the South in 2013 which I attended – there may have been slight variations to this rather sweeping analysis on the ground, but from the stands these seemed to conform to these parameters. In the higher leagues tactical variety is more commonplace. Perhaps due to the better quality of player being more flexible and able to adapt to change, or the full time training in comparison to part time lower league clubs meaning that there is more opportunity to practice and refine tactical variations. It seems obvious to say, but the quality of football is better within the higher leagues. The teams towards the top of the league system are better organised and can play in a territorial style, building on possession and working space to find space to score. Possession football, building attacks, moving the ball around the opposition and creating space are all qualities that are promoted and which are easy on the eye, helping to demonstrate a good quality of football. We have seen some very high quality players in the top league, players who do stand out above the rest. There are also those with niche skills such as the striking prowess of Kris Boyd, speed of Jonny Hayes or leadership and seemingly timeless defending and organisation of David Weir. There are also a lot of average players, the lack of money at clubs meaning that free transfer imports of very average (but tried and tested) footballers from other leagues is commonplace, with the odd gem emerging on occasion. At lower levels it is much more of a battle, hard and fast tackles, ball winning with individual skill or brilliance becoming more prominent as opposed to a measured, structured style of play which we see at higher levels and even more so at an international level. The “thunder and lightning” approach of hard tackles and fast breaks or crosses for goals outwith any distinct pattern is however prominent throughout the Scottish game. This is evidenced in cup matches placing lower and higher league teams together. An example of this would be Ross County v Linlithgow Rose in February 2016, when the latter – a Junior Team from outwith Scotland’s main league system and broad league pyramid – were on a notable cup run taking them beyond league teams en route to a 5th round tie in Dingwall. 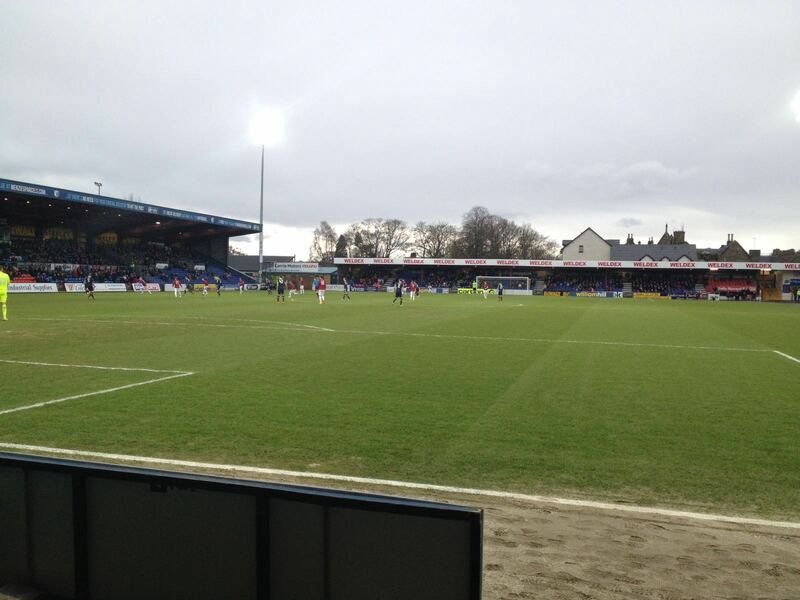 Ross County ran out 4-2 winners in the end, but 1-1 at half time and 3-2 midway through the second half was sufficient to cause a whiff of an upset. In truth, Ross County ran out comfortable winners in the end – squad depth, bringing on quality replacements as well as better fitness levels and organisation told in the end. But during the first part of the game, while Linlithgow Rose were under pressure in terms of territory and possession, they were able to fight and battle towards scoring 2 goals, the second of which featured a wonderful passing move up the right wing. The upshot of the above is a demonstration that the fighting characteristics, the ability to dig in, work and then move with a moment of skill, one cross and good header, or one great shot to score and win games within Scottish Football. This is evidenced at an international level as well, with a number of Scotland’s recent big results being largely influenced by resolute defending, organisation, hard work and an ability to take a chance. That thunder and lightning style, fighting and working before striking is evident throughout the game in different forms therefore. As Scottish football fans therefore, we expect our teams to line up in a solid manner. There is the default style which still appears to be commonplace in the lower leagues demonstrating a familiar mix and type of player in each position. But even at an international level there is an expectation that Scotland will be solid first and attacking second. We appreciate that football can be a battle, it is not always clean crisp passing and possession, but blood and thunder at times with intermittent moments of skill or brilliance. From a fans perspective, the experience of attending games is complimented by accessible stadiums, good pubs and cafes pre match to discuss football and enjoy the social aspect of the sport. With the exception of international games, admission prices are generally fair – or at least the “going rate” for 90 minutes between £10-25 in most cases. Teas, coffees and pies within grounds are always welcome at reasonable prices, homemade soup adding to the experience always. Post match, discussions on train carriages and around tables in pubs centre around the games. Everyone has an opinion on the line up, the tactics, the chances missed, the goals conceded. Thoughts on the manager’s future, support and despair. Sitting there, putting the world to rights, discussing the intricacies of the game and how we would do it, what the people at the top should do to change and improve things. This is the Scottish Football we love, admire, hate and expect.